The Black Winter Truffle, also known as the Perigord Black Truffle in France and Norcia Black Truffle in Italy is commonly found throughout southern and central Europe, mostly in France, Spain and Italy. It can also be found in the Balkans and Hungary. The black winter truffle grows at elevations of 400 to 1000 m. It grows best in permeable, porous, sedimentary calcareous soil, with some clay and humus. This type of soil is gravelly and chalky with good drainage. It can be predominantly found in limestone terrains and sunny slopes on hilly or mountainous areas where it is warm and well ventilated. It can be found at depths of 5 to 15 cm. It grows around different species of oak, willow, hornbeam, pine, aspen, and juniper. This black winter delectable is usually harvested from mid November to mid March, with the peak season occurring in December and January. Maximum harvests occur when rain is evenly distributed throughout the year, with thunderstorms during July and August and moderate rain during winter. This is why Abruzzo’s Black Winter truffles are of superior quality. Abruzzo has more consistent rain allowing these delectables to achieve their incomparable aroma and flavor. 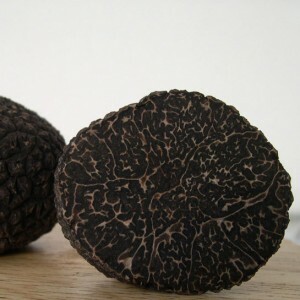 The black winter truffle also vary greatly in size. They grow from 2-6 cm (20 to 180g) up to 10-15 cm(500 to 1125g). Larger sizes of these truffles are found more frequently compared to the Black Autumn and Summer truffles. The Black Winter truffle has a different shape depending on the soil it is found in. In sandy soils it is spherical in shape and less so in more stony soils. Their outer skin have a wart-like texture with small cracks(or fissures) separating them. When mature, the skins can range from a reddish-brown to a reddish-black color. The inner flesh consists of brown with scarlet or violet hues to purplish- black at maturity. It also has thick and thin white and brown veins running laterally and longitudinally. The Black Winter Truffle has a very strong aroma. It has a rich and complex combination of pronounced, almost ethereal, sweet fruity strawberry and malty-nutty, spicy and slightly burnt coffee-cocoa aroma. The Black Winter truffle is like the older mature brother of the Black Winter and Summer truffle. It has a stronger, without being too pungent, aroma and flavour with a greater fruity strawberry note. Truly a pleasant delectable in the Tuber family. We do not make any profit from our packaging or delivery costs. Our priority is to achieve your satisfaction by processing and delivering your product within 48h, anytime at its best, by keeping its freshness, perfection, and precious aroma.